The Olympus 35 SP is an amazing rangefinder camera with manual, auto and spot exposure modes. 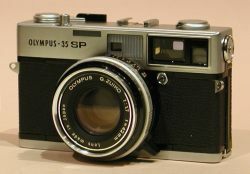 Made from 1969 to 1973, the Olympus 35 SP has amazing characteristics no longer seen on today's compacts. The lens, a 7 elements 42 mm f/1.7 Zuiko, is excellent. Its rangefinder focusing and central shutter make its operation very quiet. Shutter speeds range from 1/500 s to 1 s plus B pose. A mechanical "flashmatic" mode allows flash auto-exposure even with manual flashes : the aperture is set automatically according to the power of the flash and the focusing distance. This camera uses discontinued 1.35 v mercury batteries and has to be adjusted for today's 1.5 v alkaline batteries. The Olympus 35 SP has three exposure modes : automatic central weighted, spot and manual. The fully mechanical shutter and flash auto exposure can work without batteries. A case is mandatory as the light meter will turn off only in complete darkness. If one doesn't need interchangeable lenses, its excellent lens and the variety of its exposure modes make the Olympus 35 SP an interesting alternative to Leica M cameras for a much more interesting price. The Olympus 35 SP is easy to use. Its excellent build make it delightful to handle. The film advance is smooth, the shutter release hardly audible. Its wide aperture make it ideal for stolen pictures. The viewfinder is clear though not as much as the one of the 35 RD. It has a collimated frame with parallax indication marks. The rangefinder is quick and accurate. The release button is a bit sloppy though. The manual mode gives full control of the shutter speed and aperture. The light meter is on in manual mode, a rather rare feature on this kind of camera, and gives EV indication in the viewfinder. It is not very useful though as it does not give any information on the aperture and speed actually set. The spot mode is actuated by a little switch at the back of the body. Auto and spot modes have exposure lock by depressing the release button halfway. The auto mode automatically locks the shutter release if the picture is over or under exposed. The only missing feature of this excellent camera is a semi-auto mode with aperture priority. The sound goes crrrk-clac click-click. The crrrk-clac is the sound of the film advance lever. The first click is the sound of the shutter at 1/500 s and the second click is the sound of the release button getting back into place.